After you mark all the cleared checks and deposits, the difference between the Cleared Balance for the account and the bank statement’s Ending Balance should equal zero. Notice the use of the word should — not will. Here is a Reconcile window in which everything is hunky-dory. If the difference is small, look for small differences between the amount of the checks in the register and the actual cleared checks on the bank statement. If you find a discrepancy with a particular check, just click the Go To button to go to the check and change the amount. Click Save & Close to go right back to the Reconcile window. If the difference does equal zero, you’re finished. Just click the Reconcile Now button. QuickBooks displays a congratulatory message box telling you that the reconciliation is complete. As a reward for being such a good boy or girl, the message box asks whether you want to print a free, all-expenses-paid Summary or Full reconciliation report. Click Summary or Full and then click OK if you want to print the report. Otherwise, just click OK.
Can’t decide whether to print the reconciliation report? Unless you’re a business bookkeeper or an accountant who is reconciling a bank account for someone else — your employer or a client, for example — you don’t need to print the reconciliation report. All that printing does is prove that you reconciled the account. (Basically, this proof is the reason why you should print the report if you’re a bookkeeper or an accountant. The person for whom you’re reconciling the account will know that you did your job and will have a piece of paper to refer to later with any questions.) Also, you can always come back and print the report later, if necessary. 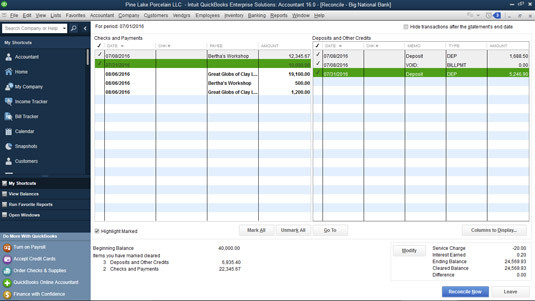 QuickBooks saves the Reconciliation reports under Reports, Banking, Previous Reconciliation. Now each deposit, withdrawal, and check that you just cleared is marked with a check mark in your register. If you don’t believe this, open the register and find out. If the difference doesn’t equal zero, you have a problem. If you click the Reconcile Now button, QuickBooks shows you the Reconcile Adjustment dialog box. This dialog box tells you how unbalanced your account is and asks whether you want to adjust your maladjusted account. The Reconcile Adjustment dialog box. Click the Return to Reconcile button if you want to go back to the Reconcile window and start the search for the missing or incorrectly entered transaction. If you want to force the two amounts to agree, click OK. Forcing the two amounts to agree isn’t a very good idea. To do so, QuickBooks adds a cleared transaction equal to the difference.